We thank you for your dedicated support of our club throughout the past 2 years. 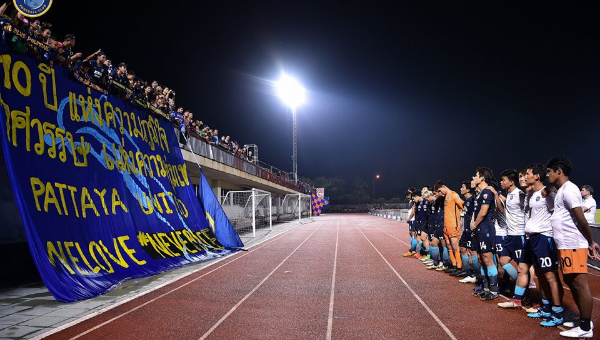 Regardless of the situation, we cheered side-by-side in friendship and camaraderie which truly helped take us this far that the club management, staff, coaches, and players will never forget. We thank Mr.Wittaya Khunpluem, President of Chon Buri’s PAO, Mr.Sonthaya Khunpluem Mayor of Pattaya City, Mr.Mai Chaiyanit Mayor of Nong Prue Subdistrict Municipality for their kind support of our club. 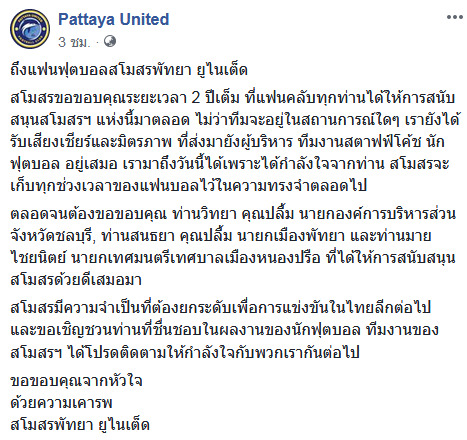 Pattaya United will forever cherish all these great memories of our dear spirited fans. It is however necessary for our professional football club to level-up certain aspects to compete in Thai League 1. We wish to invite all of you who appreciate the past performance of your favorite footballers and our team of club staff to please continue following our progress with genuine gratitude from our hearts.